TONY DUSHANE lives in San Francisco. He's the author of Confessions of a Teenage Jesus Jerk, published by Soft Skull Press. He hosts the radio show (www.drinkswithtony.com) and his column Bandwidth, appears every Thursday in the San Francisco Chronicle. He also has written for The Believer, Mother Jones, The Bold Italic and many other fine publications. DuShane is a novel writing teacher at San Francisco Writers' College, his next class starts in January. Full details will be announced next week on www.tonydushane.com. He also likes taking long walks in his walk-in closet. A nice vignette and a perfect description of the Tenderloin. I used to start at Bacchus Kirk on Bush and lope down to the Club Six on Sixth St. The apocalypse got closer before it got farther away. It’s sometimes hard to believe the neighborhood exists where it does, in the heart of the city, but maybe that’s for good reason. Thanks for this solid read and for feeding my SF nostalgia. What if you saw this girl again? Would you see her and see potential now? actually we’ve kept in touch and went on a date a few months ago. the chemistry wasn’t the same. she’s really cool, but we’ve left it as friends. Glad the Tenderloin is still treating you well. 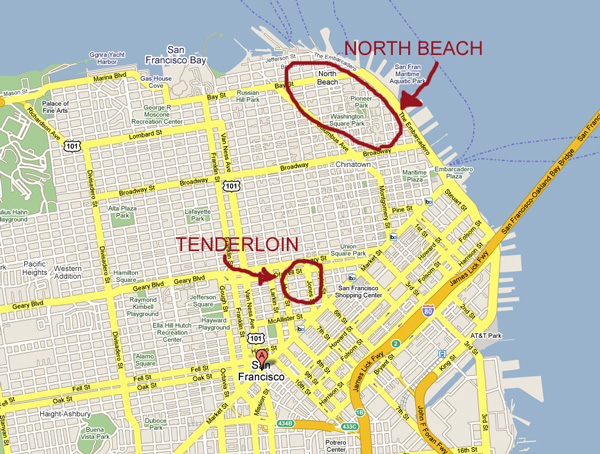 Thanks for teaching me where the Tenderloin is, I’ve heard of it but didn’t know it was in S.F. There are times I can still smell her hair. I lived in the Tenderloin 20 years ago. Hard to believe. First neighborhood I envisioned myself growing old in. Still have a chance at that. Great piece. Thanks man. Thanks. thanks hank. glad you dug it.